After much fun and games with Debian being installed on the ibook, primarily failing to get gnome to run, I decided to give Ubuntu a whirl. Ubuntu have a LiveCD so you can see how it works before installing. I burned my ISO for a mac ibook, running Debian Linux to test ibuntu using a WinXP PC! You can do this as an ISO is an exact copy of a CD. The current release is called 'The Breezy Badger'. To burn an ISO on winXP, a utitlity is needed. I used ISORecorder V2. The main ISORecorder page contains ISORecorder links for different versions of Windows. The Live CD took some time to boot (it has to look at all the hardware as it does so), but it booted straight into X. It was a bit clunky as the OS was running from the CD, but good enough as a proof of concept. So I tried the installation CD. It is installing on the ibook as I type. So far it has only stalled once, that was as it couldn't find the IP address via DHCP (a problem with IPCop? ), I chose an IP address in the middle of the range and then it carried on without problem. After setting up an initial user, the CD is removed and the system reboots. There is some time waiting for everything to configure itself. The nice thing about Ubuntu? 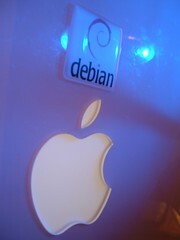 It's Debian based, so I can still use the debian decal I got a while back, it's right there, above the apple logo. The thing comes with openoffice (word-a-like), Instant Messaging, irc, and so on, all the things you would expect.